When you signup for your Trakdesk helpdesk account, the URL for your helpdesk support portal is a trakdesk subdomain, Example: mycompany.trakdesk.com. However, at some point you may want to use your own domain for your helpdesk support portal, like: company.com. Trakdesk offers a feature called host-mapping that allows you to setup your own custom domain for your helpdesk support portal. Before adding your custom domain, you will need to setup a CNAME record. 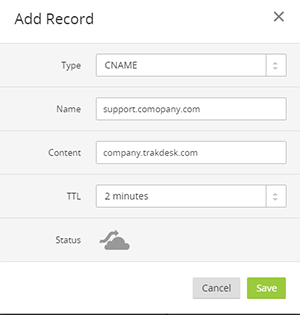 Create a CNAME record within your DNS provider's admin panel, and configure it to point to your Trakdesk.com support portal URL. For example, if your support portal URL is http://company.trakdesk.com, make your CNAME record something like http://support.comopany.com and point it to your Trakdesk support portal URL. Please allow it several minutes to update before setting up your custom domain in your helpdesk. Warning: If you are using cloudflare to manage your DNS, make sure to leave the CNAME record protection Status disabled as shown in the diagram above. Click on the Add a custom domain option. Enter your custom domain and save. Once completed, you will be redirected to your helpdesk support portal via your custom domain URL. Note: By default, your helpdesk will use a non-secure (http) protocol. If you would like to use (https) protocol, Upload your SSL certificate and enable Force SSL option in the Admin page (Security Settings).